Intelligence Bureau (IB) has issued it the notification for the post of ASSISTANT CENTRAL INTELLIGENCE OFFICER, This advertisement notification is available online at www.mha.nic.in official website of MHA Intelligence Bureau. Applicants for this vacancies before the SEPTEMBER 2017 and the more information latest job in “IB” refer the links below. What Would the Job Location? What Is The Pay Scale Offering by MHA Intelligence Bureau For Assistant Central Intelligence Officer?Can i Apply For This Vacancies?How to Apply For This Vacancies? Exam Date, Last Date and Much More?? For answer this question please keep visiting our website freerojgarsamachar.in and subscribe our email alert. Exam pattern is divided into two tier I and tier II. English Comprehension & Precis Writing) and Interview. Female/SC/ST: exempt from payment of Application Fee. Online payment can paid using debit card, credit card, paytm, net banking and any other payment gateway. The payment will be available once applicants has applied for the post and get application number and within 5 days applicants pay his application fee. Online application will start from 12 august 2017 and before applying any job, applicants do some homework of scan the passport size photograph, scan copies of documents and certificates etc. STEP 1: Official link for applying this 1430 Assistant Central Intelligence Officer http://mha.nic.in/vacancies. STEP 2: At given link click “Notification for Intelligence Bureau Recruitment Assistant Central Intelligence Office”. Now user can see the complete advertisement, last date, exam pattern, process to apply and ONLINE link. STEP 3: Visit the link and Enter details about yourself and family. STEP 4: Lastly before submitting application, review one more time that everything is correct. STEP 5: Upload the supportive documents and Picture. STEP 6: Now at last make the payment, to fully assurance that your application has received to Intelligence Bureau (IB) Department. STEP 7: Now sit tight and study for the posts as per the exam pattern... DONE!!!! Intelligence Bureau (IB) recruitment 2015 to the 05 post of Senior Mechanic available on www.mha.nic.in official website of Intelligence Bureau (IB). Intelligence Bureau has given the notification of Group ‘C’ (NonGazetted/Non-Ministerial) in Intelligence Bureau, Ministry of Home Affairs, Government of India. The candidates can apply online on or before 10/05/2015. Matriculation with minimum two years’ Industrial Training Institute pass certificate in Web Off-set Printing Technology or Printing Technology. Age Limit: 18-27 years as on closing date of application. Selection Procedure: On the basis of written test examination and interview. Candidates only can apply online on www.mha.nic.in, application start from 25 April 2015 and close on 10 May 2015. Objective type multiple choice questions on General Awareness, G.K, English, Reasoning, Mathematical aptitude, etc. For further details read carefully and go below link. As we know Intelligence Bureau had given Recruitment advertisement for 750 vacancy for intelligence officer grade II. Interesting thing is that online application date has finished. Now you guys are thinking why we tell this? Because Authority of Intelligence Bureau (IB) is going to conduct the written exam on 22 February 2015. Applicants who applied in respect IB Recruitment of intelligence officer can download their admit card. First of the exam will be held at following venue and applicants who have their Roll no come in serial no.1 venue and those have their roll no come in serial no.2 will go that exam centers. Education qualification: Applicant must have the graduation from accepted university and board. Selection process: on the basis of written test and shortlisted applicant call for the interview. Payment can be paid through the SBI challan. 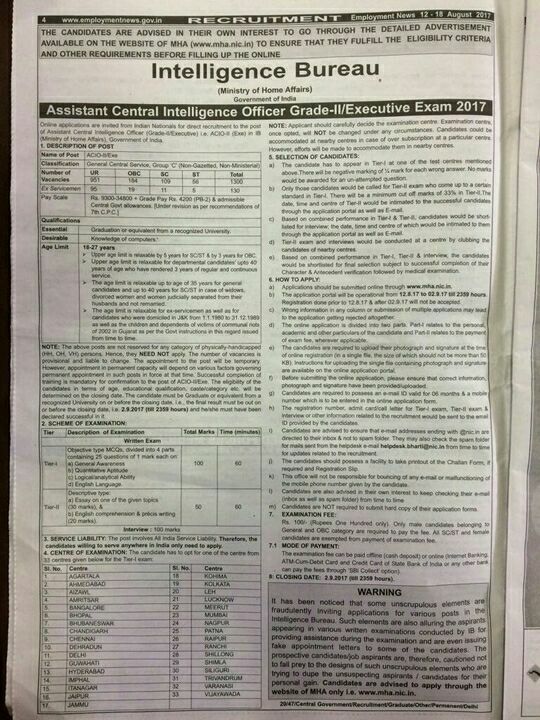 How to apply: Applicant are to apply online for the 750 post of assistant central intelligence officer. Intelligence Bureau (IB) Recruitment 2014 for the 27 vacancies of director, assistant, officer and accountant posts under ministry of home affairs (Government of India). Interested aspirants can apply online for Intelligence Bureau latest employment notification before 23 September 2014. Complete details of vacancy in Intelligence Bureau /IB 2014 such as eligibility criteria, pay scale, how to apply are given below advertisement. How to apply: In term of apply, aspirants are to send their duly filled application to 'The Assistant Director/G, Intelligence Bureau, Ministry of Home Affairs, 35 S.P. Marg, Bapu Dham, New Delhi- 110 021'. The final result of r the post of JIO-II/Tech and PA has announced.